US$1418 million generated by Codelco in surpluses for Chile, with its own production that exceeded 1 200 000 t of fine copper until September and almost 1 300 000 t, considering its participation in Anglo American South and The Abra. "Better management, in addition to the price of copper and molybdenum, partially mitigated the negative impact that surpluses had on the higher price of inputs and expenses that are made only once, such as collective bargaining," said Nelson Pizarro, President and CEO. The company achieved direct costs 5% lower than the average for the rest of the mining industry, at 138.9 (c/lb). This figure shows an increase with respect to the same quarter of 2017, due to the lower exchange rate, higher input prices and lower production. 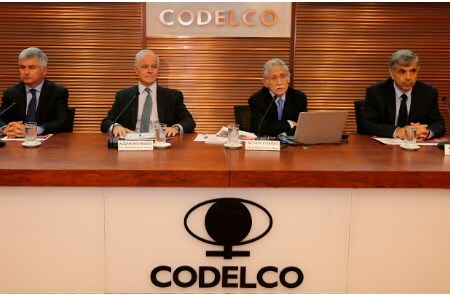 The latter is explained by a fall of 5% in the head law of Codelco's deposits, compared to the same period of the previous year, which impacted on a 56 000 t drop in fine copper. However, this decrease was partially offset by higher mineral recovery. The structural projects, which seek to extend the life of the copper company for another 50 years, continue to develop according to the budget. Chuquicamata Subterránea presents an advance of 68.9%, with 123 km of tunnels of a total of 142 km. Traspaso Andina began the excavation of the secondary crushing, continues the civil works of the primary crushing and tunnel assembly of the Haulage III belt, with a total advance of 60.5%. In El Teniente, meanwhile, the early works of the Andesita and Diamante projects were initiated, and the North Andes project of the New Mine Level was authorised. "We also have to take the decision to present the Environmental Impact Assessment Service with the studies to finalise the Rajo Inca project, which will allow the Salvador Division to continue operating for another 40 years and increase production by 50% over the levels current,"emphasised Pizarro. Among the highlights of the period, are the mutual benefit agreements achieved with 15 unions that bring together about 9 thousand workers, in collective negotiations marked by a responsible dialogue, with a term of 36 months and with figures appropriate to the business conditions. The company is investing US$1013 million in six different works to adapt the Chuquicamata smelter, including the construction of two acid plants, since it was not possible to improve the existing ones. "We had only three years to develop the engineering of the new works, their bidding and construction, that is, a meager time to develop a project of this magnitude, until September we had 72% progress of the works," explained Pizarro. In the case of Potrerillos, the continuity of the Salvador Division was reviewed in 2014, "which slowed down the engineering of all the projects involved, including those of the smelter, until there was clarity regarding the divisional continuity. the viability of the Rajo Inca project," added Pizarro. The works of this smelter will mean an outlay of US$425 million and present an advance of 72% in September of this year. As Codelco had already reported in October, the company will stop at midnight on December 12 the operations of these two smelters, to ensure compliance with the DS 28 at the beginning of 2019, during which the maintenance scheduled for 2019 will be anticipated. The chief executive of the company recalled that both smelters will not only improve in environmental terms, but also regarding their competitiveness. Chuquicamata will lower its costs by 29%, going from 48 c/lb (in 2016) to 34 c/lb (in 2018), while Potrerillos will reduce them by 21%, going from 36.7 c/ b (2016) to 29 c/lb. Meanwhile, the El Teniente Caletones smelter, which will invest US$601 million, will be ready to operate on 13 December according to the requirements of DS 28. In this way, it will be added to Ventanas, which with an investment of US$113 million, already complies with the regulations since December 2016.